I put in my first (of many) orders on Wordery this month, and they arrived this week. Here they are a-la Stacking the Shelves/Mailbox Monday! Dirty Magic by Jaye Wells – I should have bought this when it came out last year! But hey, better late than never. I adored the first 4 books in Wells’ Sabina Kane series, and hope she delivers the same awesome humour in this book. Mortal Danger by Ann Aguirre – Remember how I said Aguirre was an auto-buy? Well, voila. That being said, this book sounds great even without her name attached. Fierce, dangerous and fun. Alpha and Omega: Cry Wolf – Volume 1 – My very first graphic novel was a Patricia Briggs adaptation and I have come a loooong way since then (in terms of being a GN reader!). Hope the adaptation holds up to a more “trained” eye. Wordery – an independent UK-based site that offers free international shipping and is a great alternative to Amazon. This was my first time shopping with them, and I was very happy with everything. The books were sent out individually – so no waiting for them to be packaged together – and 2/3 came in cardboard packaging. I much prefer that, as it is easier to recycle and better for the planet. Wordery currently has 10% off everything online, so head on over while that is going on! Feed My Reader (6): The Star Trek edition! Feed my Reader is my excuse to highlight the latest e-book additions (a-la Showcase Sunday/Stacking the Shelves/Mailbox Monday). I have gone Star Trek mad these past few weeks. I have always been a trekkie and, during a recent re-watch marathon, started googling for more Star Trek info… at which point I discovered some of the brilliant audiobooks narrated by Star Trek cast members! These were my first audiobook listens EVER and I enjoyed the hell out of them. I think I binge-listened to 5 or 6 during the end of 2014. Anyhow, that kicked off my interest in the novels! I had always assumed media-franchise books weren’t the best (especially given the fabulous wealth of fanfiction out there – why pay?) but listening to the audiobooks has really changed my mind. They were all fab and some were even written by the Star Trek writers themselves so… that’s practically canon! A Stitch in Time by Andrew J Robinson – I LOVE Garak. He’s one of my favourite DS9 characters. So that there is a book all about him written by the man who played him? Insta buy! Are there any other trekkies out there who have read these? If so, let me know which I should read first! My for-review books have been piling up for a while… so much so, I thought I’d save them for one big post! Here they are a-la Stacking the Shelves/Mailbox Monday! Thank you to all the lovely publishers who sent these my way. I got quite a few lovely e-books this week. For starters, the gorgeous Poison Dance by Livia Blackburne. This is a novella set before her upcoming novel, Midnight Thief. I also got a copy of White Hot Kiss by Jennifer L. Armentrout. Not my usual fare, but it’s by such a celebrated YA author, I had to give it a go! Last but not least (heh), The Last Werewolf by Glen Duncan. This is one of those crossover-with-lit-fic Urban Fantasy novels that has received a lot of hype. Hope it is great! You can never have too many books… is what I tell myself whenever I hand over my credit card. Here’s what I’ve received/bought lately a-la Stacking the Shelves/Mailbox Monday – I’m taking a more chatty approach this month: let me know what you think! First off, I got another lovely copy of the Rags & Bones anthology for review – I will be giving this one away, so look out for that! 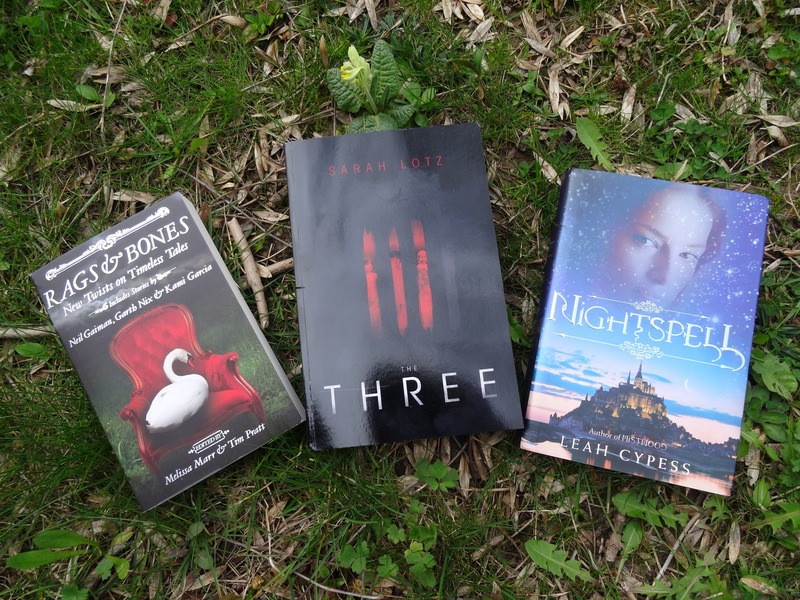 Also for review is Sarah Lotz’ The Three. I was surprised (but happy!) to see this in my mailbox as it seems like an EPIC book. It’s kinda apocalyptic rather than post-apocalyptic – something you rarely see. Oh, and the edition itself? Super gorgeous, with lovely black-edged paper. To the right we have Leah Cypess’ Nightspell, which is actually a signed edition that I won ages ago but then disappeared in my house! Glad to actually “have it” at last. Skipping the order the appear, let’s start with…. CRESS by Marissa Meyer! OMG I cannot wait to start this book. Damn real life for getting in the way!! … ahem, anyhow. I also picked up The Walking Dead, Vol. 8: Made to Suffer, despite not having read any of the series. My bookstore had a few of the volumes (not the first, of course) massively on sale, so I thought I’d give one with the Governor a go. Of course, I adore the TV series, so that bodes well for the comics. I also decided to take a bit of a risk and got Ursula K. Le Guin’s The Lathe of Heaven. I tried reading her Earthsong Quartet many years ago, but I wasn’t in love with the style. But since she is one of the world’s all-time fantasy authors – not an easy thing for a woman, might I add – I thought it only right to give her another go. This book sounds like it borders on the philosophical, which I am kinda into at the moment. This is one of the reasons I love bookstores: you walk out with books you would have never even considered! Ahem… anyhow. Since I couldn’t possibly have the series in hardback with the sixth part in paperback, I was forced – yes, forced – to buy And Another Thing… by Eoin Colfer. There was simply no other choice; my shelves demanded it. Well, that’s all for now. Looking forward to seeing what everyone else got this month! Yup! I went crazy on Better World Books again. It is one of my favourite places to get books online*, as I can get my much-loved US hardcovers at super discounted price. Also, free worldwide shipping! 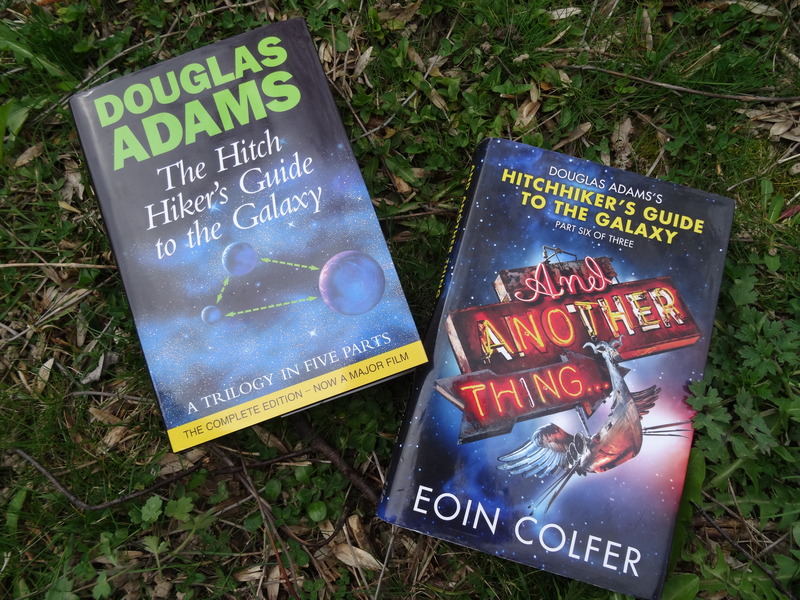 *I keep meaning to do a blogpost about my favourite book-buying sites – yay? or nay? The Stone Child by Dan Poblocki – This has been on my wishlist for many, many years but as it never came out in the UK (I think), it was hard to find. Love the cover: it gives me some many Midnight in the Garden of Good and Evil feels. The Owl Keeper by Christine Brodein-Jones – Same as above: I’ve wanted this ages but had never seen it in a store! Happy to FINALLY have it. Eon: Dragoneye Reborn by Alison Goodman – Even though I have the sequel, Eona, I never purchased the first in the series! I had been looking for a particular cover, but gave up on that when I saw it listed on Better World Books. When the Sea is Rising Red by Cat Hellisen – This got great reviews when it came out, and the cover is so very, very creepy. Love it. Only the Good Spy Young, Cross my Heart and Hope to Spy, and Don’t Judge a Girl by her Cover by Ally Carter – Alas, one of these copies came without its dust jacket! *cries* I got the US editions of these books to match my copy of the first (which I bought at the Strand) but I do prefer the UK covers. Gunn’s Golden Rules by Tim Gunn – My fashion guru! Can’t wait to go through this. Graveminder by Melissa Marr – I haven’t read a Marr book since the meh second book in her Fae series. But I am hoping her standalone books are better! The Faerie Ring by Kiki Hamilton – I know, how have I never read this? I had this on my to-buy list back in 2011… so I am definitely late! That’s it for now! 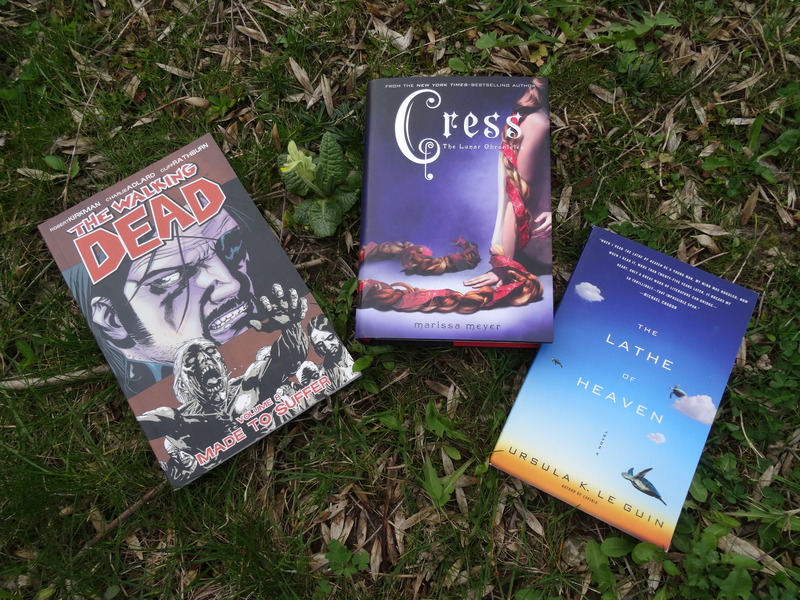 I actually have a few more books to haul, but I am waiting for just one more to come (CRESS, where are you?!) before I post about them. Hopefully next week!